Ready for part two? The day I made this for dinner, I had no idea what I wanted to eat. It was the weekend which is when I am able to do my “fancier” cooking and recipe creation. I didn’t want to squander a weekend with a boring meal, so I started the process of thinking and gathering up some inspiration. Plus I had these beautiful English Muffins Buns to use, so some sort of sandwich was in order. I wanted a nice hearty meal too. Something totally vegan, sustaining, and packed with nutrition. And then it hit me. 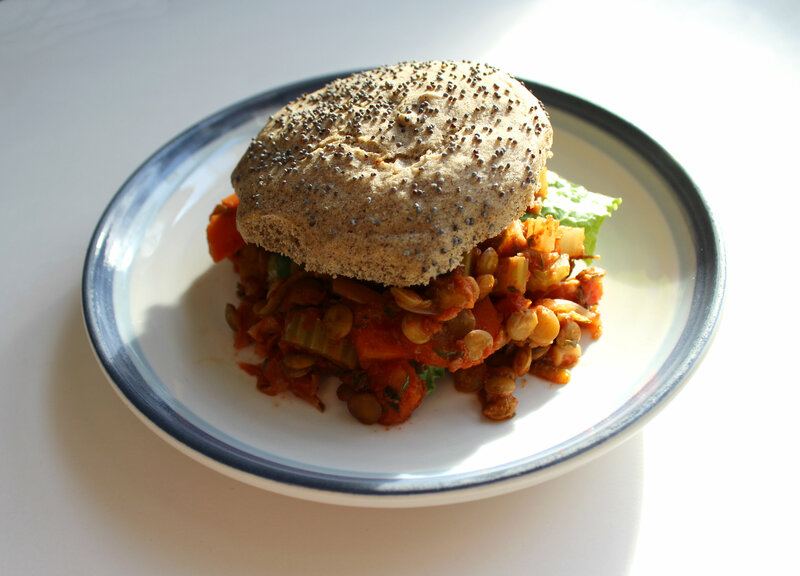 Lentil Sloppy Joes! Lentils, veggies, tomatoes, buns, potatoes, carrots, the works! A meal to feed the family. A “meat” and potatoes meal, if you will. It is such a huge misconception that vegans only eat vegetables. That could not be further from the truth. A lot of vegan recipes are way higher calorie and nutrient dense then a traditional recipes. Have you looked at the stats for beans, legumes, whole grains, and nuts? Yea you should do that if you believe these annoying vegan myths. And the protein thing. Don’t even get me started. I have many fond memories of eating Sloppy Joes as a child. It was a regular go-to dinner my mom would make for my brother and me. I am pretty sure we would eat them on potatoes rolls too. It is one of those recipes though, that you really can’t screw up. 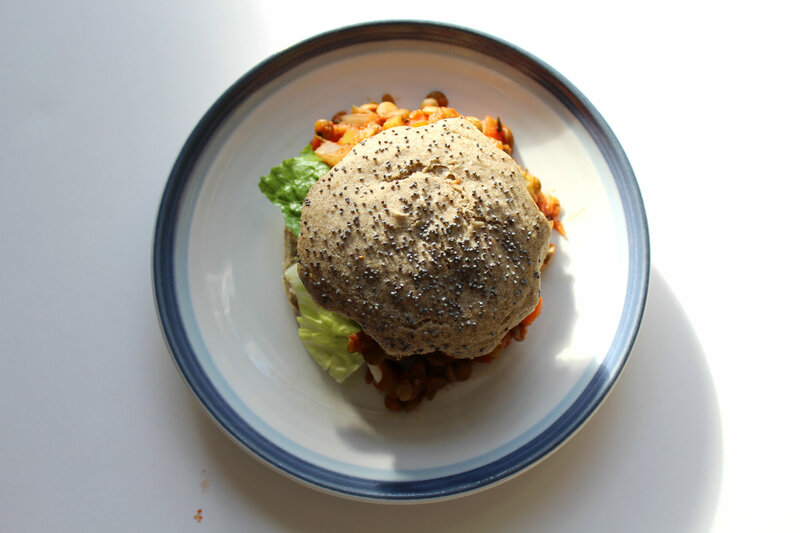 Meat, lentils, or something else, it is called a Sloppy Joe for a reason 😉 But I guess that also takes into account the messiness of eating them. That is just all part of the fun! Who wants a Dainty Joe? I don’t. I want a Man Girl Vegan-Wich! + Bring a large pot of 3/4 cup of water to a boil. Rinse your lentils and then add them to the boiling water. Boil for 3 minutes and then reduce to low heat, covered. Have your veggies prepared and add them in when you turn the heat to low. + Once all the water is absorbed, turn off the heat. Add in all other ingredients now and give everything a good mix and stir. + Now just assemble you Joes! Toast each of the buns you will be using (or not if they are fresh from the oven). 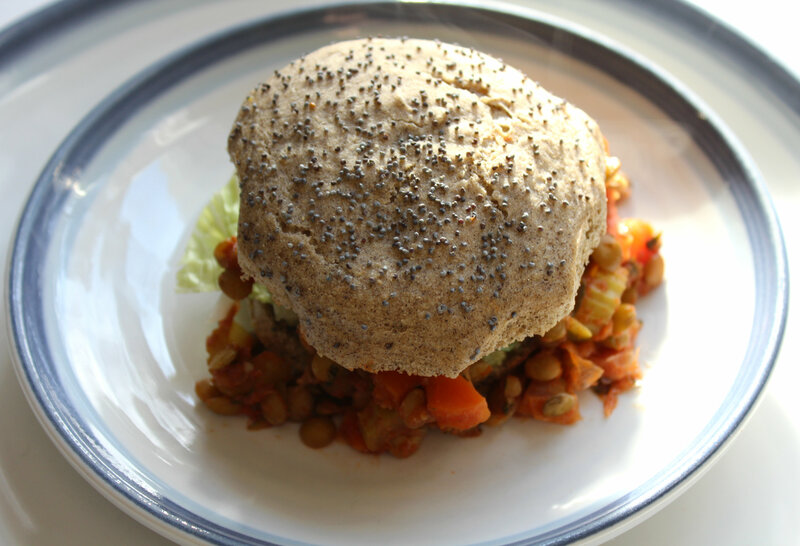 Then spread on the buns some avocado, place on some greens, and plop on the lentil mixture. Done! But wait! That is not all. You still have some work to do before you can get your hands dirty and dig in to these bad boys. How about a side dish? The “potatoes” of this “meat and potatoes” meal. Not only are potatoes involved, but I also threw in some carrots for good measure! 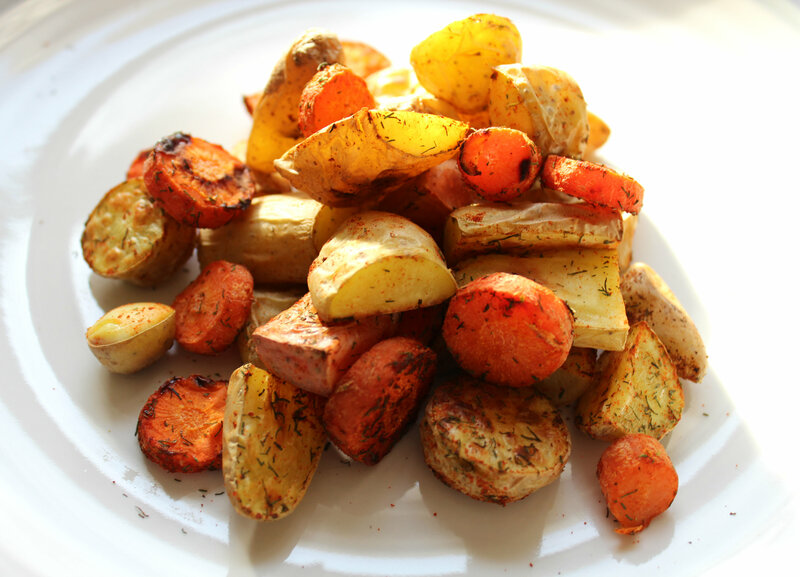 All roasted to perfection with the delightful smell and tasty zing of dill! I love dill and potatoes together. It is such a wonderful flavor combo! This was the first time I have cooked with “white” potatoes in a very long time. Frieda’s had sent me a bunch of fingerling potatoes in my monthly product box so I needed to think of a way to use them. Any white potato, fingerling or not, is pretty bland. I am used to my robust flavored purple, Japanese, Okinawan, etc., sweet potatoes. 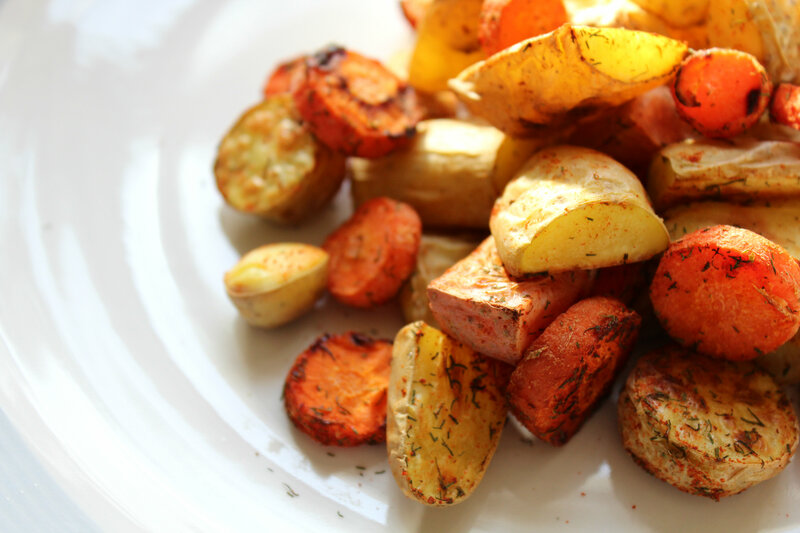 But by using dill, smoked paprika, garlic, and the addition of carrots, these potatoes we not to bland! + Preheat the oven to 415°F. Line a baking sheet with foil and lightly grease it. + Chop the potatoes and veggies in to bite sized pieces. Toss with the spices and evenly spread them out on the baking sheet. + Roast for 25-30 minutes, flipping half-way through. Remove and serve! Were/are you a meat and potatoes type of family? No, my family never was, but we did eat meat, but nothing was ever the heavy traditional “meat and potato” dinner every day every week. How do you spice up plain white potatoes? Fingerlings are the best “white” potatoes! The burgers look great, but it’s the roasted veggies that I really crave! Love adding herbs like dill when I roast. Thanks for stopping by our Happy Holidays Link Party – be sure to join us again this week (beginning on Saturday at 7 pm ET) and every week through the holidays. 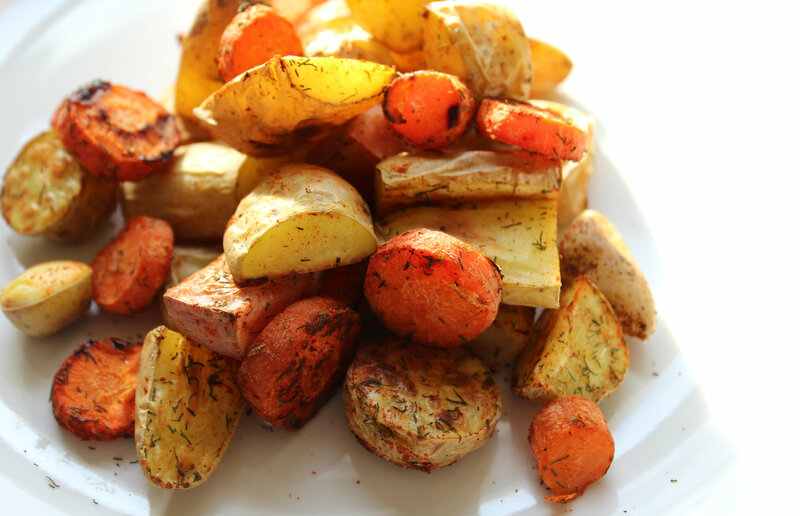 Dill is the best with roasted potatoes! Yes! 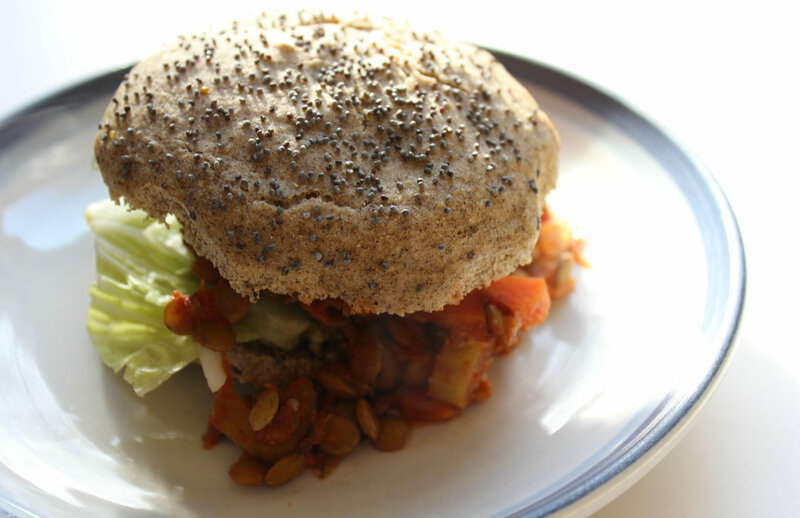 And this is a totally different take… and so much better than meat! Haha! I just started using green lentils and was looking for more recipes to use them. Thanks for bringing your sloppy joe to foodie friday. I’m happy I could give you a new idea! 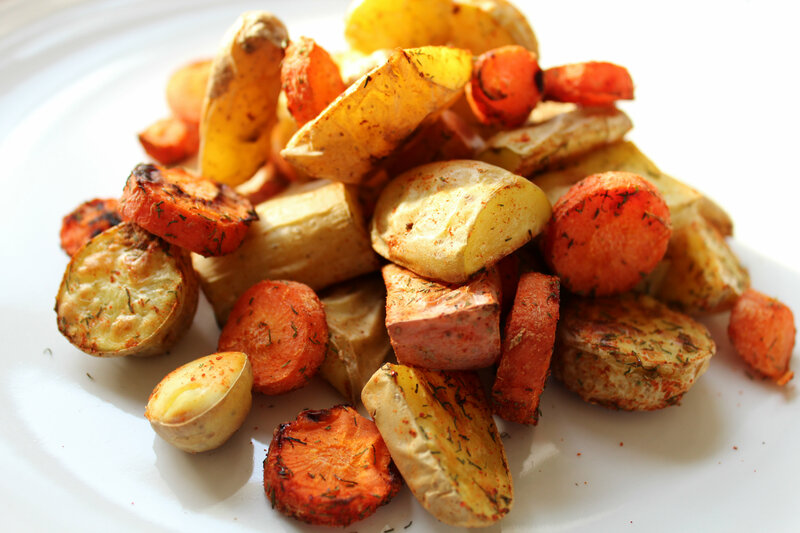 Lovely; I can never get enough of roasted veggies! Thanks for linking up with HVF! This is probably the closest thing to a healthy, hearty, vegan Big Mac and Fries that I will find and fall in love with! 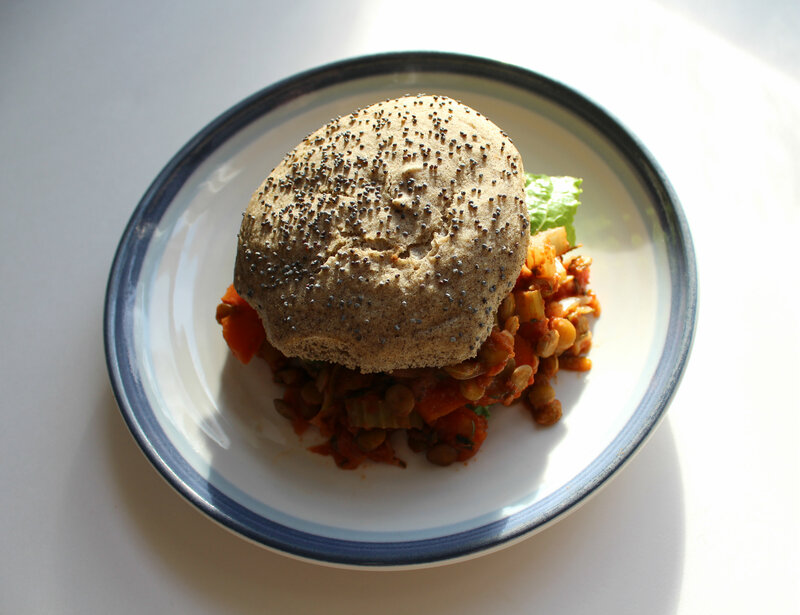 I am munching on a veggie burger while I read your recipes and now I can’t wait to make them very soon! Thank you so much for sharing this healthy and delicious recipe on the Healthy, Happy, Green & Natural Blog Hop! I appreciate it! Haha not sure if I should be happy about that but thanks Deb! I remember first seeing this on your instagram and almost drooling over my phone hahaha looks delicious! Sounds great! I did Lentil Sloppy Joes, but cheated because it was part if a Manwich campaign 🙂 I like this from scratch recipe better! I did beef mine up with all the veggies like you did, though – yum! Also, I have to try those potatoes – they sound amazing! Thanks Kristin! I just love how satisfying they are no matter how you make them! Stick to you bones health! This looks so good! I need to check out your muffins too. I’m going wheat free for a bit! Thank you Laura! Then they will be perfect! Wheat (gluten) is the devil 😉 haha! When can I come for supper? Ha! Great recipes with so much health value. Thanks for sharing on Real Food Fridays Blog Hop! Come on over anytime! I would love to be able to actually cook for someone besides myself! This looks wonderful. I fancy eating it right now! We learn new things everyday 😉 This is definitely a fuel-worthy meal! These look great! Can’t wait to try!! Hmm. I wonder if I can get Joshua to eat these. Heck, he can have something else because this recipe is now going on our weeky meal plan for next week – along w/ those english muffins. Keep the recipes coming, dear!